Friday Night Fireworks- Man Made or Mother Nature? The threat is greater to our west in the Mid Atlantic. By 8 PM a squall line should form in Western New England. Guidance suggests this stays to our north and west through 10 PM. This line of storms will be capable of strong winds and frequent lightning. Next update to be posted this afternoon. Most of the holiday weekend looks spectacular in Southern New England. The only question is tomorrow night. The Worcester fireworks have been postponed to Saturday already. Let's take a quick look at this although I will have to update tomorrow as radar trends become clear. By tomorrow evening the cold front will be in upstate New York as high pressure descends into the Midwest. By 9 PM this model is showing most of the energy west of the Blackstone Valley and Eastern SNE. I would avoid cancelling any plans as of tonight. I will keep updating this blog with the latest information as it becomes available. 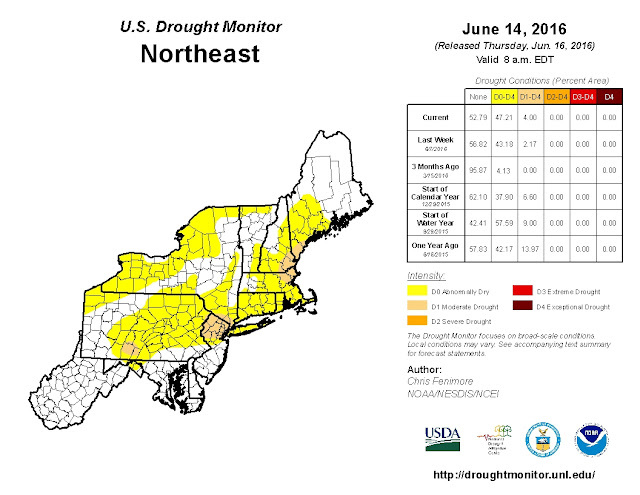 A lot of storms have fallen apart as they approach Central MA during this dry stretch. But then there are storms like yesterday morning in which an inch of rain fell in about 45 minutes. You can't blast fireworks off in that or expect spectators to sit outside as strong winds and dangerous lightning moves through. I do favor the American model at this time because I think most of the activity will be in Western/Northern New England but I can certainly see how Southern New England gets in on the action. Slow moving AM rain showers will all but dissipate by 8 AM. The rest of the day will be mostly cloudy with some breaks of sun. A cold front will cross the region tonight resulting in overnight showers/thunderstorms. Southern New England will be in the "warm sector" today which means it will be quite humid this afternoon. The front slowly clears tomorrow. A few showers will be possible but overall it will be warmer and nicer than today. High pressure takes control Thursday. I'll post on the long weekend tomorrow. My belief is that most of Tuesday will be dry. There will be some needed rain overnight but with the lawns as dry as they are people will still need to water this evening and tomorrow. Let's take a quick look at this. A cold front sweeping through Ontario and the Great Lakes will cross New England tomorrow. While the actual passage of the front will be dry an isolated shower is possible. The biggest threat will be ahead of this line after midnight across all of SNE. Latest high resolution radar trends bring the thunderstorms into Central MA and the Blackstone Valley around 3-6 AM. 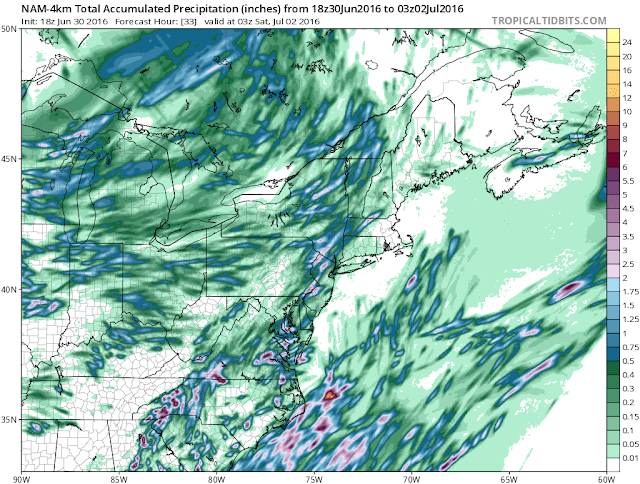 Precipitation totals will be 0.25-0.4 inches max and that is only in the embedded thunderstorms. Most of us see less than 0.1". Frequent lightning and gusty winds will accompany the downpours so don't be alarmed when you wake up early tomorrow morning. By 9 AM most of the precipitation will clear the South Coast. Drought conditions are growing again across the region just as the gypsie moths eat away at our trees. It certainly is odd to see the bare trees on June 20. Temperatures climb into the mid 80's tomorrows in Eastern MA, the Blackstone Valley and Western MA. She has now made landfall which is probably good. She was looking really nice this afternoon on satellite. I love tropical meteorology so the action is welcome after several below average seasons. As for the weekend I am thinking the Bermuda high is in control. Warm and dry- perfect for the pool and grill (or lake, ocean). A warm front will lift through Southern New England on Saturday followed by a cold front Saturday night. At the same time a complex of thunderstorms currently in the Great Lakes may survive the trip across NY/PA and enter Southern New England tomorrow afternoon. High resolution computer guidance suggests this moves across MA/RI/CT but climatology suggests it stays south. Let's break it down. This complex of storm will strengthen and sustain itself overnight. By noon time guidance suggests it is ready to enter Southern New England. Next we have to consider the trailing cold front Saturday night. There is the chance for strong storms as the cold front moves through Saturday night. It is early in the season for nocturnal New England thunderstorms so I will evaluate this tomorrow. I apologize that this "forecast" is a lot of "I believe" and "chance" but until 12 hours ago it looked like the weekend would be OK save for Saturday night storms. Perhaps as a forecaster we have been spoiled by technology and this is one of the times that I have to actually forecast so here goes. Saturday 12-4 PM - Rain with embedded thunderstorms. 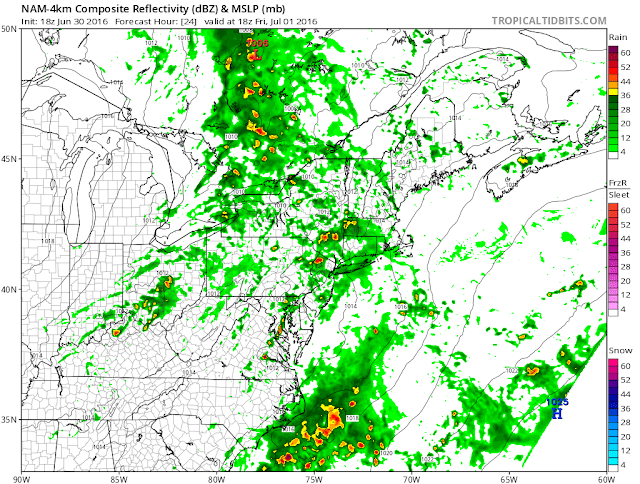 Saturday 4-9 PM - Isolated showers/thunderstorms. Thunderstorms more likely in CT/RI. Saturday 9 PM - Sunday 5 AM - 50% chance of thunderstorms- will have to refine this later. Please be aware of the possibility. A few showers are moving into Southwest Worcester County as of the 5 AM hour. A larger batch of showers is tracking through Western MA into Vermont and NH. 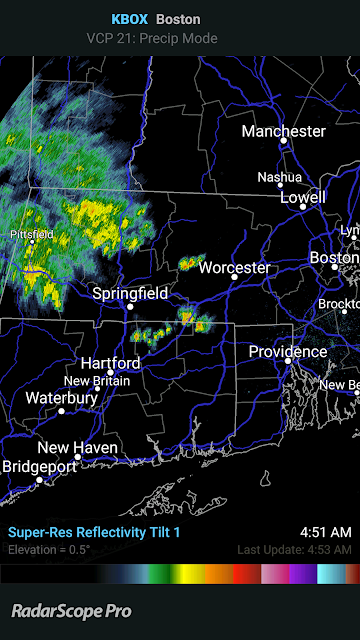 It appears these storms continue to trek into Northern New England and dissipate around 10-11 AM. In its wake skies will clear the atmosphere will destabilize. The Storm Prediction Center has upgraded Southern New England to a slight risk. High resolution guidance is favoring action in Eastern MA. There are some limiting factors that should keep the region out of a widespread severe weather outbreak but any thunderstorms will have the potential for hail and gusty to damaging winds. Keep an eye on the dew points today. I will update a new post as needed with severe watches/warnings. An approaching cold front with strong low pressure in Quebec will approach Southern New England on Tuesday. Initial showers and thunderstorms will form overnight through tomorrow morning. If these clear quickly tomorrow morning the atmosphere will destabilize for the afternoon. 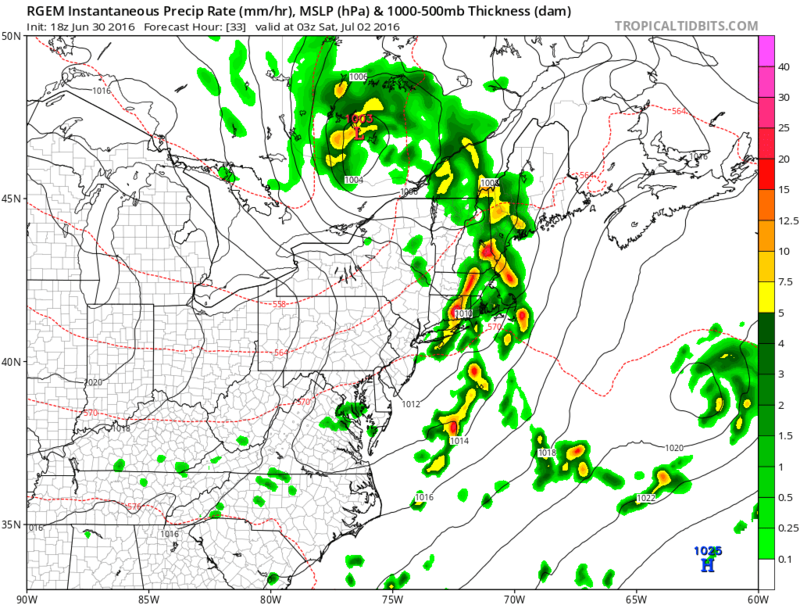 At that point strong to severe thunderstorms will form throughout New England. Primary hazards will be hail and damaging winds although an isolated tornado is possible. You can see Tropical Storm Colin off the NC coast at this time. The approaching cold front that will help produce the severe weather will also force Colin out to sea. This is good because as Colin becomes a non tropical system it will strengthen and become a fairly strong cyclone. As the front kicks out Colin cold air in the upper levels of the atmosphere will help allow for strong winds and hail in anything thunderstorms. This post will be updated tomorrow to really hone in on the hazards but if you have to be outside tomorrow afternoon please keep an eye to the sky. High temperatures should reach the low 80's with dew points in the low to mid 60's- a tropical air mass for part of the day.